"plenty", does that mean that my LM317 will emit electronic smokle and die a painful electronic death or that the risk of such a technological tsunamis is nil?? I am drueling just glancing at the beauty of that amplifier, I wish I could make my chassis look as good as that! I will fix you some more pics as it is really easy to build something like this. I have use planks of beech from which I cut four pieces that are glued together using wooden dowels. Inner meauserement is 300 by 290 mm. In the corners and halfway I have glued wooded braces to to hold the top plate in place. A friend cut the Cu for me. This was carefully drilled and then I sanded it with finer and finer paper and finally laquered it a few times. I also turned to beech knobs for the volume control and the mains switch. I will later show how I will do with those (if I can find them now). The chassis is smeared several times with a special oil and polished. The heat sink size looks adequate. On my IRF610 Class-A Mosfet Headphone Amplifier I used an LM317 as a 250mA CCS and there are no heat problems. You heat sink is about the same size but your current draw is much less, so it should be fine. CrazzyAbtTubes admired my chassis so I will try to give a few hints. I had access to better electronic tools like a table saw, through my evening class. First I cut all 4 pieces in correct size and carefully drilled the holes for the wooden dowels that would help to keep the box in one piece. To give support to the Copper-top I glued a wooden piece in each corner and here and there. For the mains inlet I simply drilled and filed holes to fit. Made special arrangements for the mains switch and volume control. I had big help drill nice holes in perfect size with this kind of drill bought at vt4c.com in HK). O btw, here's the oil I use to get the fine finish. Here's another idea to put things together. Here I simly made several cuts next to each other, using the ruler on the saw table. When I glued glied the pieces together I slid a piece of wood in the "cut". Hi Nice build, I always like to use wood in my projects. Only the "OddBlocks" are built on metal. (The prototypes do however have wood sides). All earlier projects are wood cased entirely often with clear plastic chassis tops. I don't see that there was an answer to something you implied. This is the heat sinks for the LM317s. They are rather robust but can fail. The LM317HVs can handle up to 57 volts (37 volts for the non-HV ones) and 1 amp, but not at the same time. It is easy to figure out how much they need to dissipate in the circuits. The current times the voltage across them and voila. 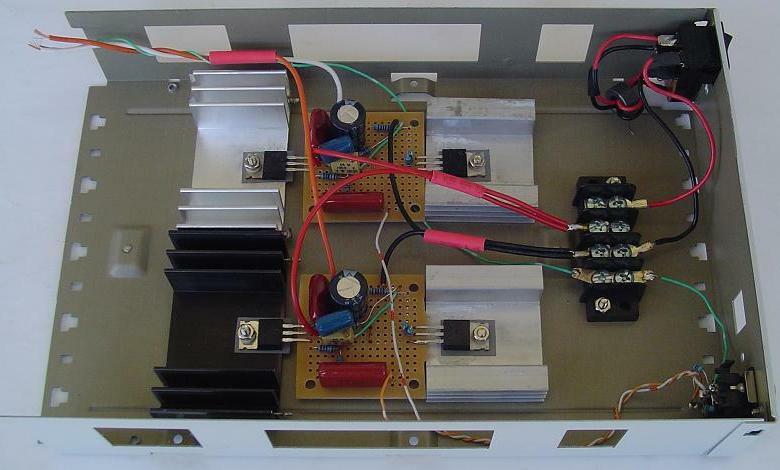 In the KT88 version of the amps it is right at 7 watts. The KT77 version and 6L6GC versions are about half that. So for most uses a heatsink with only a few square inches is fine. The ones I use are finned and roughly 2 inches high, 1.5 inches wide and a half inch thick with fins. The ones in your photos are clearly large enough. In one of my earlier projects with EL84s I used a common heat sink for both channels. You must us insulators to do this though. I generally use heatsink grease (old carry over from power supply projects) and make sure there is adaquate air flow. At 7 watts (in a KT88 amp) things can get rather warm quickly if there is no air flow. Other parts may fail because of the elevated temps. Almost through with another project; will give you details later; I am about to finish my Odd-Job ... errr ... OddWatt. I will also try to give some details about another Swedish Odd-Watter. Hi, I was just looking over one of the early posts and wanted to provide some of my misguided insights that were brought clearly home this past weekend. The subject is amplifier power output. The post mentioned a concern that the tube amplifier was less powerful and might not be up to the job. Yes for sure this can happen. However, I had the opportunity to demo a pair of KT88 Odd Blocks at a high end audio store this past weekend. I specifically when there because I wanted to test (and hopefully buy) a pair of Martin Logan ESLs. These a 4 ohm hybrids with a sensitivity of 90 db at 2.83 volts. Which you sharp eyed folks will note is more than 1 watt (like twice that). So with the ML recommended minimum power of 100 watts it would seem that a 25 watt tube amp should be rather marginal. The room was about 35 feet wide by 30 deep and 15-18 tall. This is a really large space for a home system. The amps were able to play quite loudly and without distortion in this environment. So what does this mean, I'm not really sure. A watt is a watt no matter how it is produced. I suspect that the answer is that we have succombed to the bigger is better hype. Personnally, I would not worry about having enough power in an amp (if you have reasonably sensitive speakers - those of you with 80-82 db ones - sorry). I would worry more about quality of the sound. BTW a pair of ML Vistas are now in my listening room. ... my main workhorse is a 10W PP-amp (6AQ5), but I felt that this one (3,5W/ch) sort of sounded "louder", maybe because it can handle lower frequences better. But it took me some time to make the switch, so I cannot tell. But shortly, for me 17W will be LOUD as I notice that 3-4W is more than enough. My major concern is my new speakers (AudioXpress, The un-orthodox 2-way), but time will tell. Besides I have a pair of 60W monoblock (Circlotron) stowed away.